Tereszka, a child in a residence for disturbed children. She drew a picture of “home” on the blackboard. Poland, 1948. A girl who grew up in a concentration camp was asked to draw “home” and what she drew was scribbles. It shows how the horrors of the concentration camp warped her mind. It’s a mystery what the lines truly mean to her, probably the chaos or the barbed wire. 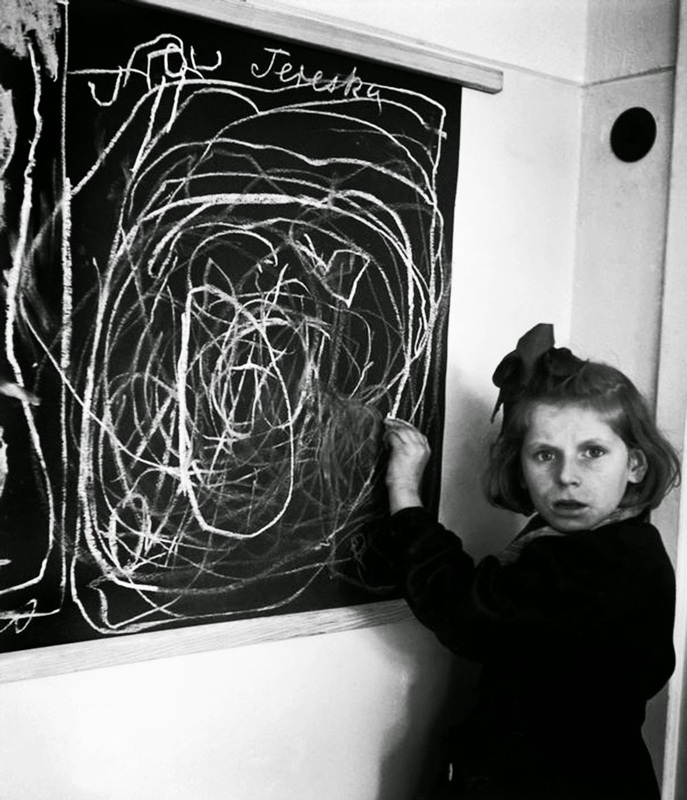 This photograph was taken by David Seymour in a home for emotionally disturbed children located in Warsaw, 1948. There are a few versions of this image, but most of the captions (including one at the War/Photography Exhibit currently on view at the Brooklyn Museum) mention that the subject grew up inside a concentration camp. There’s little information about the girl’s identity, her name was Tereszka, a diminutive version of Teresa. Her eyes are piercing, like a window to her soul. Not the eyes of an innocent youth. She’s probably experienced horrors at that age most will fortunately never have to. Like the soldiers who have seen heavy combat, she’s got the terrifyingly haunting one thousand yard stare. Most children who survived the Holocaust emerged from hiding places – attics and cellars, caves and forests, convents and monasteries, and homes ranging from huts to castles. When the war in Europe ended in May 1945, more than 1 million and perhaps as many as 1.5 million Jewish children were dead, targeted victims in the Nazis’ calculated program of genocide. Of the estimated 216,000 Jewish youngsters deported to Auschwitz, only 6,700 teenagers were selected for forced labor; nearly all the others were sent directly to the gas chambers. When the camp was liberated on January 27, 1945, Soviet troops found just 451 Jewish children among the 9,000 surviving prisoners. Her eyes are piercing, like a window to her soul. Liberation for children was not necessarily liberating. Mostly, parents did not come for them. Children waited for years until hope too had died. The youngest survivors did not know their names, country of origin, or even their first language. The older ones faced untold hardships and, for most, 3-5 years more passed before they had found a home. Children were swept up from Europe and resettled in England and Israel, the United States and Canada, Australia and South Africa. Their experiences were very different from the older survivors. Generally speaking, those under age 16 or 17, by war’s end, were taken in by foster families, returned to school, and discouraged to speak of the past. That is a truly depressing article. I wonder what happened to her. 1. Diminutive version of "Teresa" is "TereSka", not "TereSZka". There is difference like between "JohNNy" and "JohMMy"
3.Why You wrote here about Holocaust? In 99% she wasn't Jewish - Teresa isn't semic name. I think that She was Poles from Warsaw and She lost her home (maybe also famlily) in Warsaw Uprising in 1944 when She saw how Germans destructed her home (and draw it on the table). 4. Please, remember that not only Jewish were goal of genocide made by German in period of World War Two. They (German) also exterminate many Gypsies (c.a. 0.5 mln) and Slavs (Polish, Russian, Ukrainian, Belarussian - more than Jews). Tomasz is right in saying that German regime didn't just exterminate Jews but many of the Europeans, and so many Polish people. World War 2 started when Germans invated Poland. Most of that war took place on polish territory. Otherwise, thank you for that well thought out comment! My French cousin (Jewish) is Teresa, and she's called "Tereszka". There are no hard and fast rules. Why wouldn't the author write about the Holocaust? That child would most probably have been Jewish! As for the Warsaw Uprising, that was preceded by the Warsaw Ghetto Uprising...ie, the uprising against the might of the bloody German Army and SS by unarmed, starving Jews whose fate was, inescapably, death at the hands of those monsters. Don't be so coy about your Polish compatriots of that time, Tomasz. Sure, many died, but not because they were Poles....more likely through collateral damage, as they refer to it these days. Whereas the Jews of Poland and all of Europe under the control of the dreaded Bosch were specifically targeted for death through asphyxiation in the gas chambers; shooting; torturing; starvation; being worked to death, and being the subjects of the most horrific so-called ''medical" experiments. All this, of course, after being thrown out of their homes, which were taken over, with no payment of course, by their Polish neighbours! Yes, there were those Polish and other gentiles who tried to rescue their Jewish neighbours and/or friends at great risk to their lives, but not enough. There were far more who betrayed Jews who were trying to survive outside the ghettos, by pointing the finger at them with the life-ending word, "ZHYD"! Yael, that girl was survivor of Wola Massacre, wich for sure wasn't "colateral damage". Not only Jews where targeted for death - Poles were in not much better situation and there were German plans to kill most of them just like Jews. Tomasz is correct. Germans killed about 6 mln Poles, including 3 mln Christians and 3 mln Jews. It's difficult to tell if Tereska (her name visible in the photo) was Christian or Jewish. Tomasz, you are right that she is 'Tereska' not 'Tereszka' acording to the word written on the blackboard, but as far as I know this name was also given to Polish-Jewish children. There were not less Polish Catholic orphans than Polish-Jewish orphans, and here you are right as well. The word holocaust, however, is referred to roughly 3 millions of Polish-Jewish, 3 millions of other Polish (mostly Catholic) in Poland and about 3 millions of non-Polish Jews with members of some other social and ethnic groups exterminated by Germans, so this is not exclusively Jewish experience, so she can be a non-Jewish child who was found in one of the German concentration or labour camps, she could be one of the children hijacked to Germany to raise as German and retrieved after the war. Also, this girl could draw the ocean of ruins if she came from Warsaw and her parents had been killed by Germans. She could come from one of the Soviet concentration camps, where she could lose her parents, before being repatriated to Poland under Soviet control. Perhaps we will never know. As a genealogist, I often face situations that official names to many assimilated Jews (included children) were indeed Jewish in documents, but from families I usually know only their Polish names, which they used every day amongst themselves and in their everyday life. Naturally, nothing is known about the girl's family so there is no way to ever check it. If only her town of origins was known and if in that town Jewish books of births for late 1930s-1942 were preserved, one could make a list pos children born in those years with a big hope she would be one of them. However, people at that times often ignored registering children, but still this could be a step forward in attempts to find her true self. Anybody knows what later happened with the girl? Children are children, torture is torture, hate is hate.....the origin of the child is inconsequential because the effects were the same for all, relentlessly horrifying. Nice of Jesus to put them in that position in the first place. As for god, is he the same one mentioned on the belts of every German soldier? Their buckles said "God is with us". Steve, I know it's hard to not be mad at God for something like this. Unfortunately, we all have free will, and there is so much evil in this world. Try praying to God and have faith in Him instead. Or maybe your an atheist and you don't believe in God. In which case, you can't blame God either. Because there is no God in your mind if your an atheist. It is so sad we might use a name so clearly associated with compassion as God, Jesus, Spirit etc as a justification for murder and hate. But there you have it...Humans are sick and need rescuing from our own self-convinced ideals. Surely this can work if we accept full responsibility for our own sickness. God doesn't need people to kill, He takes our lives back when he's good and ready. War or not, our time is always coming so Love while we can. I think she is not jewish. Jewish children this small were sent to gas chambers right on the spot, unless infamous doctor Mengele hadpicked them for his experiments. Very sad, but also disturbing and slightly creepy. I wonder about the psychology behind why she drew some scribbles. Anyone have any theories? Looks like the tangled branches of bushes and shrubs she probably camped near right after the war. I think this can be seen in 2ways. She is definitely traumatized. Her eyes say it all. If she is in a hospital post war she most was a Jewish child. Although most children went directly to the gas some children did survive in the camps. Think Buchenwald camp. The drawing could be 2 things. 1. This is her trauma and 2. 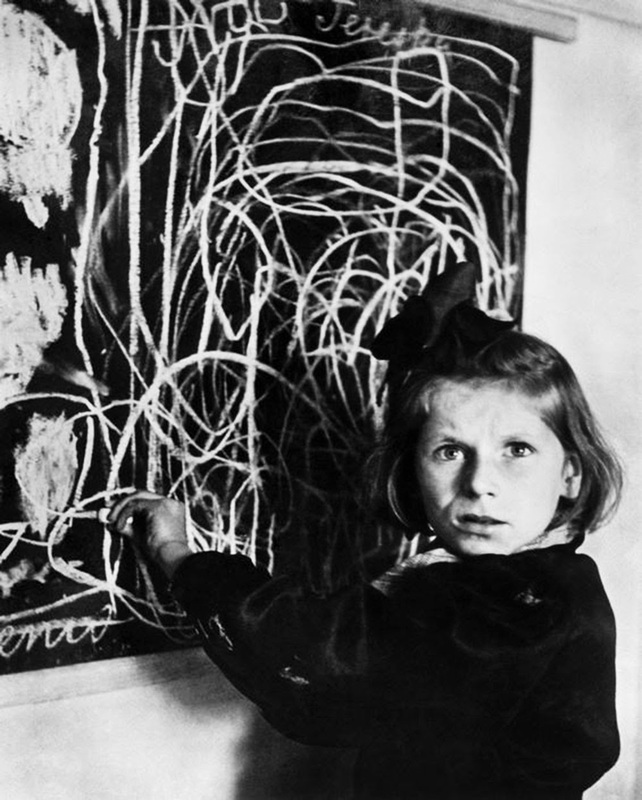 As a young child during war she had no chance at an education including writing and drawing. Either way its a very sad photo. I wish we could find out what became of her and her family. Yael, please don't confabulate. Poles were also killed for the sole reason they were Poles. Like all Slavic nations, they were second in line for extermination. Auschwitz started out as a camp for Poles, it became a mass death camp for Jews in 1942. Everyday life as a Pole under Nazi occupation were not less dangerous and humiliating. They were treated only slightly better than Jews. You had to walk off the pavement to the sewer, take off your hat and bow whenever a German soldier was passing by. Public executions every day, not to mention that going out to buy some food was a risk. Police and soldiers randomly closed the street, rounding up all those unfortunate enough to be there, and sent straight to the camps. And there you either went to labour, or to the gas. So no, Polish civilian casualties were not "collateral damage", but deliberate extermination. When they'd be done with Jews, Poles were next in the line. "There were far more who betrayed Jews who were trying to survive outside the ghettos, by pointing the finger at them with the life-ending word, "ZHYD"!" A common misconception. Of course, such scum was also among Poles. But they were a minority. For them the life-ending word was "Shmalcovnik". Polish resistance regularly hunted down people who collaborated with nazis, and such people were ostracized by everyone, because there was no bigger insult than to collaborate with an enemy just to earn a buck. Look up who has the most trees planted at Yad Vashem Institute: Poles. The image of Poles as regular antisemites is quite new and, for me, disgusting. Especially for me, since my grandfather fought as a partisan with a ghetto escapee by his side. Near my home town there is a village which was slaughtered just because a man was hiding a Jewish family. Just few examples, but there is more of them. Much more than shmalcovniks. We weren't saints, but let the man without guilt throw the first stone. As for the picture...That is probably the best description what this child have endured: Hell. Trauma caused by things no one should ever see, or experience. World War 2 have made a giant, still bleeding scar on every nation of the globe. And this little girl shows how large this scar is. Like a famous photo of shellshocked British soldier, it shows pure horror of war, which doesn't end after a ceasefire. Mikolaj, the first and foremost reason for the Second World War was Hitler's (may his name be erased) psychotic hatred for the Jews! Since the Jewish population of Poland was a whopping 10%, that was the obvious place for him to start on his murderous rampage. Hence the largest number of European Jewry was murdered in Poland alongside a great number of Poles of course. Ergo, the number of Poles honoured at Yad Vashem for giving succor to their Jewish fellow citizens is proportionately greater than that of other nations. Polish antisemitism is well documented -before, during and after WWII. Young thugs would come to the villages on market days, exhorting people not to buy from the Jews. On Saturdays (the Jewish Sabbath) gangs of thugs would often roam the public gardens looking for Jews to attack. And after the war came the notorious pogroms at Kielce and Jedwabne. Something to think about, no? Other than whether that poor little girl is Tereszka or Tereska. And now you have the jews walking around the streets and killing innocent Palestinians, slaughtering their people. If Jews had so bad in Poland, why were there so many of them, more that other countries? I am not saying that there was no antisemitism. Yes, there was antisemitism, some terrible things happened before, during and even after the war. Europe at the time was quite antisemitic as a whole. But not all Poles were antisemites and some risked their lives for Jews and in some cases lost their lives for Jews. World is not black and white. Google Ulma family, Polish family killed for hiding Jews. Husband, pregnant wife and six kids, all executed on spot. First of all, Jedwabne happened during the war, not after. And there is evidence that whole event was instigated and orchestrated by local gestapo. Still lots of false information surround this topic, so i simply don't judge until i check my facts...Unlike some. As for pogrom in Kielce, like in Jedwabne, there are lots of false info on that. Many historians put local communist "security" police to blame. And they loved to fabricate facts. Very possible version was that it was a police intervention gone wrong, ending up in a shootout, after which a riot broke out. And a boy who made up the whole story about being kidnapped by Jews because he just ran away from home. But the harm was done. Like i said, we weren't saints and i can admit that. Unlike some. A pity that Western people are so focused on Polish "well documented antisemitism" without checking their facts an/or without aknowledging that Poland was one of the few countries that let Jews to settle while whole of Europe was banishing them or burning them at stakes for hundreds of years. Who cares what she is? But, as for the other issues raised in comments? Yes, Germabs killed many people, even their own disabled. However, of all demographics it was only the Jews who were slated for extinction. If one were a Sinti (etc, i.e. "Gypsy") they were exempt from persecution if they ever served in the German Military. Since conscription had been universal that meant many had. They were exempt if they lived AS Germans (meaning assumed the German Culture). Jews though? Not only was there no exemptions but many didnt even know they were part Jewish. The Nazis persecuted anyone with a single Jewish grandparent. One could not even know that one of their four grandparents had been Jewish. One could be a Baptised and practicing Xtian, clueless of their ancestry and yet they were slated for death. Actually, just recently her history was discovered. She was Polish child who fled from Warsaw when the uprising broke out. After witnessing all the crimes, the murder, the torching, the executions Germans committed on Warsaw citizens she lost it. She and her sister left their apartment in hurry with their grandma, but when their grandpa returned to the house to get something for the road she was shot by Germans. Tereska and her older sister walked 2 to get to their relatives. After this traumatic experience she felt constant hunger all her life. Her father was a member of resistance and when he was captured by Germans he lost all the teeth after 'interrogations'. It was her mother task to provide for the family. You have to remember that Poles were second class citizens in their own country and simply deprived of all the basic human rights. To this day I can't understand what got into Germans to treat other human beings like that. It's disgusting. As you can see, this is no environment to raise a child. Some years after the war she was placed in mental institutions when her condition worsened and her family couldn't give her proper help. She died there after unfortunate incident. It's a hear-breaking story, for me personally what's worst is that it's probably not cruelty of nature, but the deeds of man who caused her to be like that. Image your world being shuttered down and your childhood becoming a tale of pain, fear and hunger. This is long story made short, I hope that if you care about Tereska you can do your deeper research. I think people automatically assume that if a child suffered during WW2 they must have been Jewish. Not much is said about suffering of Polish people. Like someone already wrote here, 6M polish citizens died, and over 90% were civilians. It's deeply depressing when you have to wonder if these young children would have been better off not surviving. After all this girl grew up in a camp only to spend most, if not all, of her life in a secure home for the mentally ill/disturbed. Children who suffer that kind of trama at such a young age are more damaged than an adult or teen. They are still forming the base of their personality and learning to interact with others and once that base is formed it becomes intrenched. It's hard to undo behaviour and emotions that deep in your past because the brain just isn't capable of "rewritting" those neural pathways.